Just out of curiosity is there any red telephone boxes in Glasgow left. Cant say I’ve seen one for years. There is one in the back garden of one of the houses in Roslyn Terrace, in the West End. There is also one just inside the main gate of Glasgow University, also in the west end. But these are in captivity; there must be others in the wild. By the way, the red phone box was designed by the grandson of the guy who designed Glasgow University and the son of the guy who designed St Mary's Cathedral. And even more by the way, the design of the red phone box is based on the monument that sits on top of the grave of the english architect John Soane. Not many people, as they say, know that. When BT replaced all the red boxes, they waited a year or two then declared that there were no more red boxes left in use, anywhere. I see them all the time though, but for the life of me I can't remember where! Ther are/were lots left in Dundee a couple of years ago, I do remember seeing them. Lots in Kilmarnock, Irvine, Kilmaurs and Stewarton. Fenwick also has three! One is a plant pot though! My ex work has one as an aquarium. Slightly off topic I know, but there's a good one in a wee village called Clachan between Tarbert and Campbeltown, which is painted white and has only two sides, taking the form of a porch to a house, the open sides being to the house door and the street. There used to be one in a garden centre (in use as a plant pot) between Balloch and Gartocharn, but I think it's awat now. Even rarer are the type of red phone box which replaced the traditional type, ie more angular and with big single panes of glass. Anyone know where any of these are? 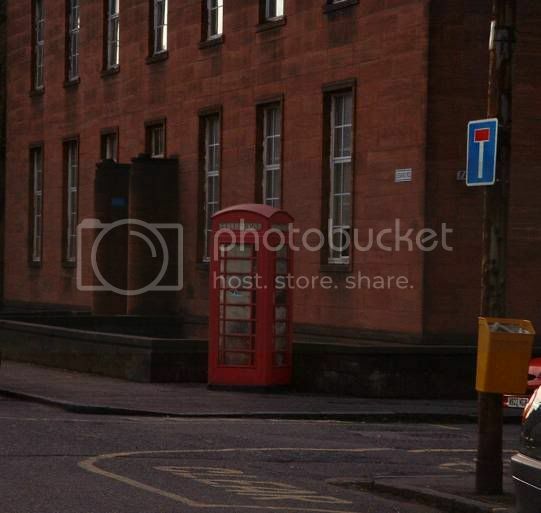 Theres one of the old red phone boxes at the junction of Auldhouse and Reverford Rds... just up from Newlands Safeway. ... which isn't a bad idea actually! There's also one still standing on platform 1 in Kilmarnock Station. It even reeks of p*ss. Hows that for authenticity? I knew I passed one regularly, just couldn't remember where. Saw it again today, Bearsden Cross, Roman Road, across from the school. The Modern Fossil wrote: Just out of curiosity is there any red telephone boxes in Glasgow left. Cant say I’ve seen one for years. Not Glasgow I know but I was out in Callander, Stirlingshire, at the weekend and there were plenty out there. It seems the only phone boxes there were red ones. theres one in kelvindale, but its in some ones garden..... no seriously. I'll dig out the one we took a couple of weeks ago too.